CNC-machined front lower suspension bulkhead made from premium Swiss 7075 T6 aluminum. Identical left and right sides. Orange color. Fits XRAY T3. Ultra-lightweight bulkheads were designed to get better traction, steering, and balance. Bulkheads are 2mm higher to allow LiPo batteries to fit perfectly into the car. All bulkhead parts are CNC-machined from premium Swiss 7075 T6 aluminum and are strategically machined to provide the lightest possible support framework for the car. Thanks to the ultra-low platform it was possible to create the smallest, and lightest bulkheads ever. 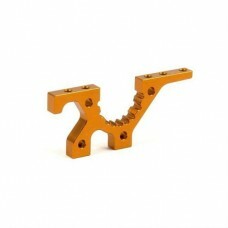 The bulkheads are anodized in a distinctive orange color. (Note: Color may vary slightly between products.) XRAY’s legendary attention to detail is noticeable in all the precisely chamfered edges. XRAY’s attention to detail and perfection is evident with their TQM (Total Quality Management) approach. Not only are all bulkheads inspected during the production process, but they are also mounted to the chassis to verify that the car’s “backbone” has been perfectly manufactured. So when you open the box, you will see and appreciate the beauty. The front bulkheads feature a split design, enabling extra-easy access to the front differential making diff changing quick and easy. The bulkheads also feature machined grooves for diff eccentric hubs.